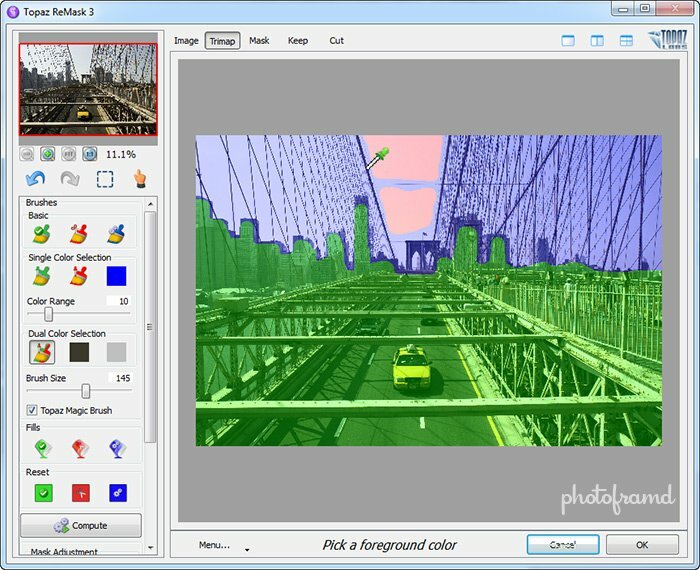 Topaz Labs released the first version of ReMask in Fall 2009 as an easy tool to create Photoshop masks. Now in Version 3.2, Topaz ReMask is a powerful masking utility that can handle very complex situations in a fairly simple way. Just take a look at the above photo. 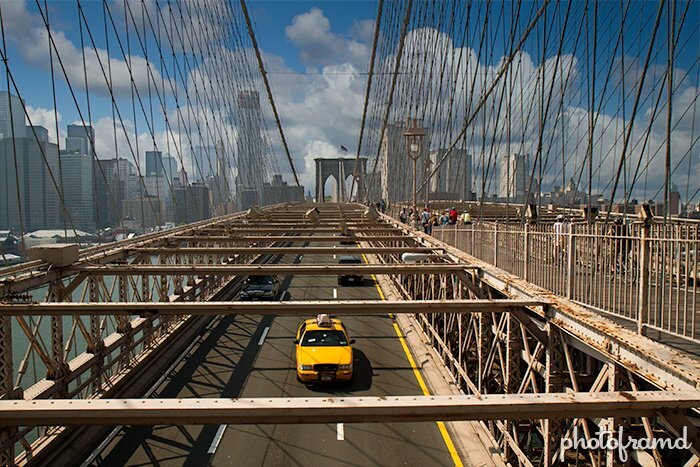 In the original shot of the Brooklyn Bridge, the sky was as boring as a plain bagel. After a few minutes with ReMask, I turned it into an Everything Bagel! 1. Starting with a Blue Fill instead of Green. When you launch Topaz ReMask 3.2 in Photoshop CS5, it will create a duplicate layer and open that layer in the plugin’s interface. Normally, ReMask starts with a green fill (for protected areas) and you would draw areas with red (for areas to cut) and blue (for areas to compute). These three color together create the Trimask which ReMask uses to calculate the final mask. Since I need a complex mask to knock out the sky, I started with a blue fill to force ReMask to really work. By clicking Blue Reset button, the entire photo filled with blue. Next, using the Green Basic Brush, I drew an outline around the areas I want to protect and then filled it with the Green Fill Bucket. 2. Identify areas to be cut. There are a couple simple areas to exclude, so I used the Red Brush to outline them and filled them with the Red Fill Bucket. 3. Complex areas require the Dual Color Selection Brush. The Dual Color Selection Brush is actually 3 different tools in one. First, use the Green Eyedropper to identify the color to keep. The tool will them change to the Red Eyedropper to identify the color to remove. Finally, the tool will change into a brush for you to brush over the area to be cleaned-up. Building a complex mask is simply a matter of cleaning up one area and then starting the process again in the next area. 4. Check your progress by clicking the Mask button. The ReMask interface allows you to quickly jump around and check your progress. Clicking the Mask button will allow you to see the accuracy of the mask. You can also use the other buttons to flip between the original image, the Trimask, the Keep area and the Cut Area. You can continue to refine the mask with the different tools and force ReMask to update by clicking the big Compute button. When you are satisfied, click the OK button to return to Photoshop CS5. 5. 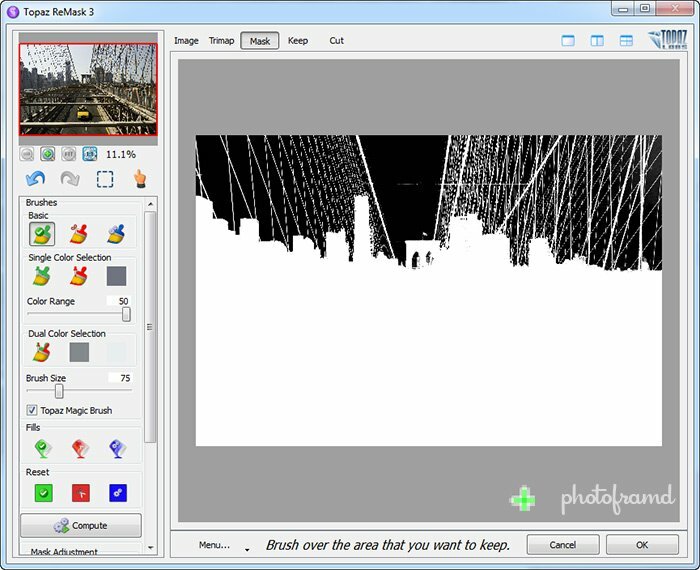 Drag in your new fill layer and finish the image. 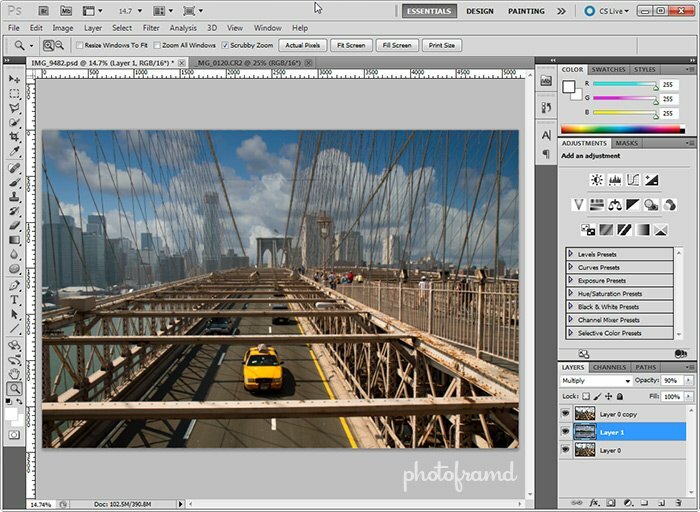 Back in Photoshop CS5, you will have your original image as the bottom layer and the new masked layer on top. I dragged my replacement sky layer into Photoshop and placed it between the two previous layers. By creating this “sandwich”, you can use the Layer Blending modes to tone down the new layer and produce a very realistic effect. The sky layer was set for an Opacity of 90% with a Multiply Blend. 6. Complex Masks with impressive results! The final effect is very impressive and took only minutes to create. 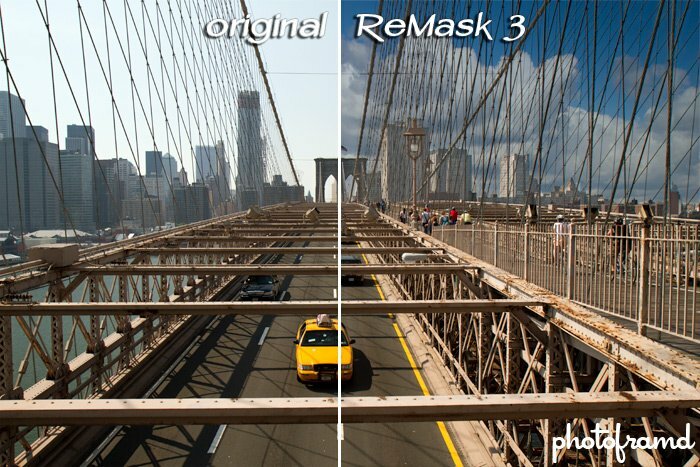 Topaz ReMask 3.2 was just released last week, and it is a free upgrade to licensed ReMask owners. To celebrate the new version, Topaz Labs is offering a $20 discount on new licenses of ReMask 3.2 with the coupon code of quickmask. You can download ReMask 3.2 to try it yourself and check their Webinar schedule for live demos. Topaz ReMask is also part of the Topaz Bundle which now also includes Topaz Adjust, Topaz DeNoise, Topaz Lens Effects, Topaz InFocus, Topaz Simply, Topaz Detail, Topaz Clean and Topaz DeJPEG. That’s why I call it the Only Photoshop Plugin Bundle you will ever need! ← Previous Previous post: Canon PIXMA Pro9000 Mark II only $50 at B&H Photo! Next → Next post: Hell Froze Over – I’m Using Lightroom 3!